The BMW 3 Series Diesel Saloon is one of those cars buyers should always get excited about when a new one is released. It’s evolved over the years, got better each time and continues to combine an upmarket, sophisticated image with affordable running costs. It’s also fantastic to drive and remains the small exec saloon that sets benchmarks in this class. OSV takes a closer look at what it’s all about with our 2018 BMW 3 Series Diesel Saloon review. One of the reasons people love the 3 Series so much is because it’s genuinely fun to drive. It offers nicely weighted steering, firm suspension and plenty of grip, all of which ensure it’s entertaining down winding country lanes. The steering suffers from a bit of a dead spot when you’re at motorway speeds, and this has been acknowledged by BMW who say they’ve tweaked the steering after receiving feedback from Chinese and U.S. customers who don’t appreciate a bit of twitchiness. Unfortunately, that dead spot isn’t going to suit everyone. Adaptive dampers are available as an optional extra, and we definitely recommend them. It doesn’t matter how powerful the 3 Series is, adaptive dampers boost ride quality and the car is better with them than without them. A 6-speed manual transmission comes as standard but buyers can pay an extra £1,500 for the 8-speed automatic. It’s well worth the extra cash, as it’s usually more efficient than the manual and it changes gear with greater smoothness. In terms of the engines, it’s easy for the diesels to get forgotten about with a car like this but they shouldn’t be discounted. The 320d model covers the 0-62 sprint in just 7.5 seconds, and offers more power than the similar petrol engine. It’s quick, frugal and it’s our top pick. It’s a tad noisy in traffic but once you’re fully up and running it’s responsive and smooth. However, the 320d model might be too expensive to buy outright for some of you. If so, a turbocharged 2.0-litre diesel engine powers the smaller 316d model. It develops 116bhp and can get you from rest to 62mph in 10.6 seconds. The mid-range model, meanwhile, is the 318d diesel, which develops 150bhp and has a 0-62 time of 8.4 seconds if you select the automatic. Stick to the manual ‘box and 0-62 is dispensed within 8.6 seconds. 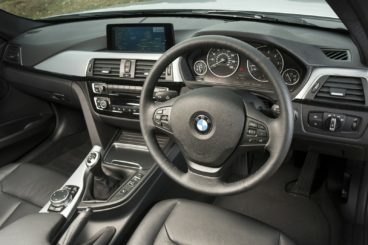 BMW’s reputation for high-quality cabins has taken a hit in recent years, and there’s been a noticeable amount of harder plastics. However, they’re back on form with the 3 Series, which has a cabin that’s classy, logically arranged and which boasts plenty of high-quality materials. Overall, it’s a relaxing place to spend your time on the road. As usual, the dashboard has a driver-focused slant and sports a wraparound design with the dials and angles tilted towards you. All the dials and controls are easy to read, everything is properly located and therefore easy to find, but choosing white climate controls seems like an odd touch. They do stick out. We love the dash-mounted colour screen which you’ll use to control various functions, though. Is the BMW 3 Series Diesel Saloon practical? It’s not as big in size as vaster rivals, such as the Volkswagen Passat, but it’s the biggest 3 Series so far. There should be enough leg and headroom for most rear seated passengers, but a high transmission tunnel will annoy anyone sat in the middle. Space up front is absolutely fine, there are plenty of storage areas, including a massive glovebox, but the doors don’t open wide enough to make accessing the rear seats easy. Visibility is fine but we recommend spending extra on the parking sensors, while the boot measures 480-litres. That’s good for this class and it also boasts a user-friendly layout. Standard kit on the new car is good, with all models getting standard cloth seats, a three-spoke leather steering wheel, rear parking sensors, BMW’s ‘remote services’, a trip computer, a digital radio, a USB connection, Bluetooth and sat nav. The SE model adds automatic lights and wipers, an auto-dimming rearview mirror and separate air conditioning controls for the passenger and driver. The Sport model adds sports front seats and more chrome trim, while M Sport models get a thick-rimmed multifunction steering wheel, ambient lighting, full leather seats, M Sport logos. In terms of how safe the car is, it was awarded all five stars when crash-tested by Euro NCAP. Its standard safety kit includes a tyre pressure monitoring system, electronic stability control and plenty of airbags. Optional safety kit includes adaptive LED headlamps, xDrive four-wheel-drive, lane-keeping assistance and blind-spot monitoring. Prices for the new car start out from £27,755 and rise to £45,645. For more information on our leasing deals, you can check out our page here. 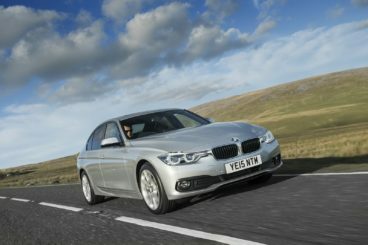 In terms of its running costs, the 320d – which is our top pick of the range – is both fast and frugal, and can return as much as 74.3mpg if you opt for the automatic variant. It also emits less than 100g/km of CO2 and should appeal especially to businesses. However, the 320d is more expensive to buy than either the 316d or the 318d models. Incredibly, though, it’s cheaper to run than both of them. The 330d model, meanwhile, returns 56.5mpg economy, while the more powerful four-wheel-drive xDrive M Sport model is good for 51.4mpg and emits 145g/km. As ever, the 3 Series is a pleasure to drive. It can get you from rest to 62mph in 7.5 seconds and returns over 74mpg. Not bad at all. It’s a strong and reassuringly powerful car. The optional extras can easily bump the price right up. Too much choice? With five diesel models available, perhaps so. Let’s see how the car fares against its rivals in the comparison section of our 2018 BMW 3 Series Diesel Saloon review. 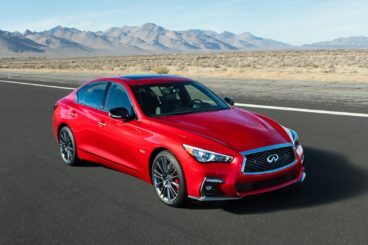 The new Infiniti Q50 Diesel Saloon is bursting with quality but it can’t compete with the BMW where a dynamic driving experience is concerned. On the road, it’s clear that Infiniti has tried to make the Q50 as sporty as possible, but they’ve ultimately come up short. It’s steering just doesn’t transmit enough feedback which stops you from getting too involved. Adaptive steering is available as a £800 optional extra but it doesn’t improve the way the car steers. In fact, it makes it worse. Other technologies include lane-keeping assistance but they, too, take things away rather than improve the driving experience. The 168bhp diesel won’t satisfy most buyers. Its power output is too modest, as is its 0-62 time of 8.5 seconds. Moreover, it isn’t smooth or quiet and is hard to recommend over any of the 3 Series’ diesels. It’s cheap to run, however, and can return as much as 65.7mpg on a good day. Emissions stand at 114g/km of CO2 and the Infiniti Q50 Diesel Saloon has a BiK rating of 22%. Running costs are good, then, but surely not enough to tempt buyers to change their minds about the BMW. Inside, insulation is decent. The diesel engine is noisy but active noise-cancelling helps to keep most of its racket outside the cabin. That said, the system doesn’t hold up to too well when you put your foot down and accelerate hard. The diesel will get noisy, and its noise will enter the cabin. There’s lots of hi-tech equipment inside the Q50, including a pair of touch screens that dominate the dashboard. The sat-nav is excellent – one of the best around – and overall the interior is one of high quality. Is the Infiniti Q50 Diesel Saloon practical? Its boot measures 500-litres, which makes it bigger than the BMW, the rear seats are spacious enough and adults should be just fine whether they’re sat upfront or in the back. It’s also worth mentioning that the Q50 as the longest wheelbase in this class and is the longest car. Despite this, we’d say the BMW has more interior space. Parking sensors are standard, and without them, the Infiniti would have been tricky to park. The Jaguar XE Diesel Saloon is stylish, reasonably affordable and can rival the BMW when it comes to tidy handling. Jaguar has gone for a sporty but comfortable drive here, and it’s worked out well. It’s not quite the sharpest in this sector but it’s still a lot of fun to drive. The steering is accurate, reacts quickly to your inputs and feels nice and weighty. Buyers get to choose between a 6-speed manual and an 8-speed automatic ‘box, and we prefer the latter. It’s smooth, responsive and you can take control by using the paddles mounted behind the wheel. JaguarDrive is standard on all models, allowing you to switch between four driving modes to suit your mood or the conditions. Four-wheel-drive is also available but we don’t recommend it unless you think it’s absolutely necessary. In terms of the engines, the 2.0-litre diesel engine should be popular. It’s available in two power guises, with the 161bhp able to cover the 0-62 sprint in 8.4 seconds if you stick to the slower manual gearbox. The 178bhp variant covers the same sprint in 7.8 seconds, while a 25d model develops 237bhp and can haul you from a standstill to 62mph in just 6.1 seconds. Running costs? The smallest diesel engine is super cheap to run and can return 75mpg while emitting less than 100g/km of CO2. It also has a BiK rating of just 21%. The 178bhp variant returns 67.3mpg, while the biggest diesel is good for 60.6mpg, which is still very impressive. Inside, there’s a real sense of occasion. The design is dramatic, a rotary automatic gear selector that emerges from the dash is one of many distinctive highlights, while fit and finish are among the best in the class. Like the BMW, the Jaguar gets a driver-focused wraparound dashboard, while the low-mounted seats enhance the XE’s sporty character. There are plenty of upholstery options to choose from, the blue ambient lighting is sophisticated, and the new 8” touchscreen is crystal clear. 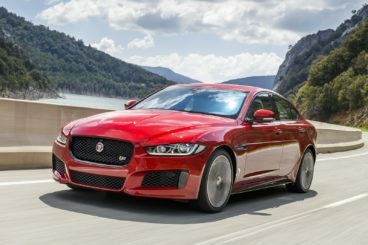 Is the Jaguar XE Diesel Saloon practical? Its boot measures 455-litres, which makes it smaller than the BMW. Adding the space-saver wheel means you lose another five litres but we recommend it. It’s also a deep boot and the lip is small. Other than that, the driver and passenger will be just fine for space up front but rear seated passengers will feel a bit cramped. A large hump will frustrate those sat in the middle while storage space is average. Visibility isn’t helped by thick windscreen pillars and shorter drivers might struggle. This car has led the compact executive market for decades, but has it still got what it takes to lead the chasing pack? Like a world-class sports team, it’s showing no signs of being knocked off its throne. Its competition may have gotten better, but so has the brilliant BMW 3 Series Diesel Saloon. Impeccable.